On 29 August 2015, the UNU-IAS Operating Unit Ishikawa / Kanazawa (OUIK) will hold the second lecture in its Noto’s Satoumi Lecture Series. The event will take place in Anamizu town, Ishikawa prefecture, Japan. The curvy coastline of Anamizu bay is dotted with many coves and coastal villages, where small communities have lived on narrow coastal areas between mountains and the sea. Thanks to the bountiful natural resources of the land and sea, local people’s livelihoods have traditionally depended on agriculture and fishing. 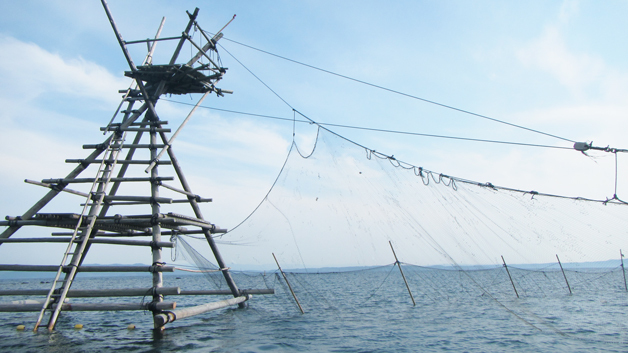 The region is thus home to many traditional fishing practices, and although they have dwindled over the years, the designation of Noto Peninsula as a Globally Important Agricultural Heritage System (GIAHS) in 2011 has helped to revive an interest in the so-called Satoumi Movement. The Japanese term satoumi refers to seascapes comprising different uses and habitats, formed and developed through human interaction with nature. In the upcoming lecture, The Satoumi Movement and Anamizu Bay from the perspective of “Satoumi Capitalism, UNU-IAS OUIK will welcome Kyousuke Inoue (Chief Executive Producer, NHK Enterprise), who will explore the concept of natural capital and “Satoumi Capitalism” — which is also the title of his recent book. He and other speakers, including stakeholders from the fisheries industry, will explore the economic potential of the traditional fishing practices of Anamizu bay and how Noto’s designation as a GIAHS provided an opportunity for the community in Anamizu to utilize satoumi capital for economic development and conservation efforts. In particular, the lecture will discuss satoumi’s role in the revitalization of local industries, and how in turn these industries have embraced satoumi as a movement that is worth preserving. This lecture is part of a UNU-IAS OUIK educational campaign focused on the Satoumi Movement, which introduces and promotes the Noto Peninsula as a successful example of satoumi and a leading region for research on satoumi conservation. Please note that this event will be held in Japanese only, with no interpretation provided. For more details, please visit our Japanese website.